Jace DeCory. 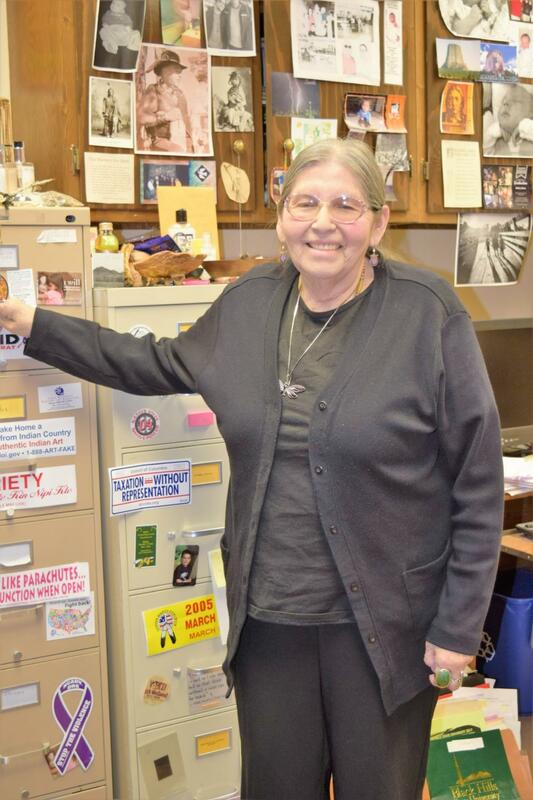 BHSU American Indian Studies Assistant Professor stands in her office, surrounded by over three-decade legacy of materials. “Know who you are. Be true to your own spirit. Find your passion in life. Mine has been learning & teaching. It has not been “work.” Each one of us are put on this earth for a purpose. Do your best to fulfill that purpose, in the most positive way you can, be well.” Love, Mato Ina (Mama Bear) Jace. How did you initially get involved in Indian studies? DeCory received her undergraduate degree in anthropology and American Indian Studies from University of North Dakota, in Grand Forks – May 1973. She was not yet 21. She turned 21 that August. To a young person wondering what ‘the heck she would do’ with an Anthro/Indian Studies degree, DeCory said one of the reasons she started teaching was the amount of misinformation about Native peoples and true ignorance of Native culture and lifeways in academia. Her good friend Twyla Martin-Kekahbah contacted her from Turtle Mountain in the Chippewa Reservation. Martin-Kekahbah attended UND with DeCory and approached her on doing consultant work. She used to do in the summers while in college – writing grants, and consultant work for different reservation programs. She also taught some educational anthropology classes. Decory then traveled to Turtle Mountain to help develop curriculum for core classes they wanted to offer. Martin-Kekahbah wanted her to create the curriculum for the classes offered at the start of their fall semester. That meant just two and a half months after Decory’s graduation. DeCory eventually agreed, jumped right in and began her research. She looked at courses offered by other institutions. The two came up with a few ideas after a little brainstorming with their community college board. They decided to start with some basic classes. These included intro to Sociology, Math, Cultural Anthropology, and the possibility of a fun one for the A.I.S. people (American Indian Studies) – hands-on traditional technology or arts and crafts-type class. Decroy Balked with no teaching background or credentials. She knew from experience that teaching was a lot of work – both her parents were teachers who taught mainly in elementary and secondary education. They both received their degrees from Northern State University. Her Dad first taught schools in East River, the Redfield area. He coached where they lived in the two little towns that didn’t have schools – Frankfort and Bradford. Her mom commuted to finish her degree. Once this was done the family moved to southern California for six years – Decory spent those years in their school system. Her parents eventually divorced – her father remarried and stayed in California and her mother remarried and moved to Nebraska. Her mother moved back to South Dakota to teach at Pine Ridge. During this time DeCory had continued and finished high school at Rushville High School. “I’d seen all the things my parents did – I grew up with that, I’d seen my parents always looking for materials – so it wasn’t that difficult for me to find things. I watched my mom do all that so I knew what had to be done. Kinda of on-the-job training watching her,” she said. This time DeCory told Twyla she’d have to pray on it at her Sundance that summer. The ceremony was the third week in August very close to the school year to start. She had a hard time of it, it was a tough ceremony, but she felt she could at least try teaching and see how she could do. “I’ve seen my parents teach but this is Higher Ed – this is adults,” DeCory explained. This was her first teaching job in the classroom – anthropology, sociology and traditional technology class, and GE’D instructor. At that time were their many American Indians teaching outside of Tribal College? “No, I was their Native faculty and Twyla was their first Native college president there,” she said. “Everyone in the classroom was older, but one student. He had just turned 20, and I was 21.” DeCory knew him from UND – Andy Laverdure. He and his mom still remember her. His mom took the class and was much older at that time and wanted to support the college movement. “I always say that those elders taught me a lot that first few years of teaching,” she said, adding that she had formed a lot of good friendships and connections up there. What followed were a couple of tough years for DeCory. She fell while dealing with health issues and rheumatoid arthritis that flared up living next to a cold lake. In the aftermath she had broken her ankle. Later she had a car accident. She thus re-evaluated and went back to independent consultant work off and on for a couple of years. She worked with a few different tribal colleges. “I felt the movement was really good, really important,” DeCory stated. Tribal Colleges were then in their infancy in the 70s and growing. She worked both with Cheyenne River College and in the summers at Standing Rock – Sitting Bull College. DeCory took a job there as the American Indian Studies coordinator chair. While there she helped develop courses for their curriculum. Evelyn Gabe was the Lakota language instructor at Sitting Bull College, Earl Bullhead’s auntie. He called her mom or Ina—in Lakota. “I became really close to that family, the singing, the language. It was really good at Standing Rock,” she said. Decory began doing more things at Cheyenne River as an enrolled member of the Cheyenne River Sioux Tribe. The tribe invited her down to help develop their community college. She worked briefly for about 18 months with the Tribal Chairman there. She met her husband Sam at a Lakota language conference in Pierre during this time. “I was intrigued. We got to calling – a long distance relationship – he was busy doing things at a youth culture camp on the Pine Ridge reservation – Oglala/Calico area,” DeCory said. “He was helping young people get reconnected to the traditions, language and the culture.” Vietnam Veteran am Decory was enrolled along with their two sons in the Rosebud Sioux Tribe. After a while they stayed with one another. DeCory was staying at her mom’s place in Batesland in between jobs. They decided to get married and had their first child Dana, who had been born with multiple deformities. He is buried with Sam in the Black Hills National Cemetery. The loss of their first son devastated DeCory. “I think Creator gives you challenges in life. I’m not that strong but with prayer, I can get through anything,” said DeCory. She began attending Sundances in her late teens and eventually became a dancer herself. DeCory said that she was making that transition from a “fallen-away Catholic” to the pipe way. She still attends church with her 100-yearold auntie, though, who is deeply practicing. “I go to church with her if she wants me too, but this is a different lifestyle that I like better,” DeCory explained. Sam was just beginning to have health during the time he married DeCory. He had just been diagnosed with diabetes and figured out his illnesses were tied to the lingering effects of Agent Orange. Sam had served four and a half tours in Vietnam as a Green Beret in the Special Forces. “He was a very strong man – a member of the people,” DeCory said. Then the job to teach American Indian studies opened at Black Hills State University in January 1984. “I thought that was exciting,” Decory said, “After I got in there I enjoyed it.” She added that she was the only American Indian instructor on campus at that time. Dr. Ronnie Theisz, a German who grew up in Austria, knew the Lakota language and spent a lot of time on the Rosebud reservation. He also spent time on the Pine Ridge Reservation with Matt and Nellie Two Bulls, Nelly Menard, Albert White Hat, Stanley Red Bird. “He knew all those old ones – key peoples,” she said, adding that he even sang with The Porcupine Singers. Having DeCory offer new American Indian studies classes worked well when one considered the curriculum work DeCory had done prior. Black Hills State University had been a cooperating institution that helped set up Sinte Gleska Tribal College in Rosebud and Oglala Lakota College in Kyle. “We were a Title 3 Institution so we helped to set up their colleges, and there were already American Indian studies classes on the books,” DeCory said. “A number of them.” Ronnie and her had to decide what classes they wanted to offer from their then offices over in the old Wenona Cook basement. She taught five classes that first and second semester. “Typically that was my course load,” she said. “15 hours because we didn’t have anyone else to teach and we wanted to rotate those courses, and offer a variety.” Ethnobotany came later. DeCory was instrumental in finding a Lakota Language instructor as at the time they lacked one. “It takes a special teaching to teach the language.” After some years they were able to add another instructor – Dr. John Glover. Now there were two American Indian instructors. “It helped a lot she said, especially since he could teach tribal political systems – Indian Law stuff,” said DeCory. “I had to teach that stuff too with no background – it was crazy. So I put in a lot of prep time. I learned a lot.” DeCory said this was a field that was not her expertise. By 1986 she had another son. “At that time they had no maternity leave so I took all my personal leave time,” she said. Dr. Theisz found others to teach her classes for a while. Calvin Jumping Bull from Pine Ridge and Patrick Lee – it took two teachers to fill her shoes. DeCory got her Masters in 1986 from SDSU in Counseling and Guidance in Education while she was teaching. “It was not even in American Indian Studies,” DeCory said. She went to graduate school a couple years prior at the University of Washington in the late 70s before she taught at BHSU. She thought of the fish-ins she was part of and the Bolt Decision (1977) and realized the missing time gaps. “I mark them by the different events in Indian Country,” DeCory said. The program started in the early years with less than 15 students in a classroom. It has now reached new heights, especially a few years ago with 30-40 students enrolled in American Indian Studies. “Now they are kinda going back the other way,” she said, adding costs and other factors. DeCory started the BHSU American Indian Honoring Ceremony on their front lawn in the early ‘80s with her husband Sam. “We started honoring American Indian graduates first in our yard. We would give them their eagle feathers/plumes, medicine wheels and star quilts,” she said. “It was exciting.” They saw hundreds over the years graduate and honored them at their “Feasts and Feathers” ceremony. It has outgrown its beginnings and venue. They have held it in Hudson Hall (owned by the city), the basement of the Catholic Church and now they have it in the Friendship Hall of the United Methodist Church. This past May 19 Lakota students were honored. With no time yet to publish much but ‘bits and pieces’, DeCory said she still does research with elders. Currently she teaches a class called the ‘He Sapa Cultural Experience’ where she takes students to the sacred sites including: Mato Tipila (Bear Lodge – Devil’s Tower), Mato Paha (Bear Butte), Black Elk Peak and ‘Íŋyaŋ Káǧa ‘in Wyoming (Motion of the Stone -Medicine Wheel). “It’s an inactive volcano so our people went there to get stones for their inipi (or sweat lodge),” DeCory said. “If you think about it – Pte Sla is over here, that’s in April. In May they went to Inyan Kaga, In June the people were camped over by Mato Tipila, and then further west– summer solstice when they figure out where their Sundance was going to be – it’s a cycle.” Next Monday she will take people over to pray at Pé Sla. With the addition of Dr. Glover and now with Nikki Dragon, who teaches American Indian Literature classes, it has grown. “I don’t think I ever taught an American Indian Literature class – though I might have – maybe one. I did more of the pre-History stuff, the old, traditional stuff –ceremonies of tribal cultures” said DeCory. DeCory will still be giving presentations. She recently gave one in Harvard – part of a panel. They spoke about the Dakota Access Pipeline and other contemporary issues affecting American Indians today. “Dr. David B. Miller, a colleague who used to have this office, used to call Black Hills State University – The Harvard of the West,” she said. “So went I went over there I told them about that and said, I come from the now I am here to speak to the Harvard of the East.” “They loved that,” she said. Decory went with her sons up to the No DAPL Sacred Stone Camp in Standing Rock several times. “We had relatives at the camp so I wanted to check on them, see how they were, but also it was such a momentous occasion – you had to go at least once to pray and be with some of the relatives there,” she said. Sons: (1988, 34) (1986,) Dawson (youngest) and Sam Jr. Sam had two sons from previous marriages – Dallas and Shawn, tribal police officer in Eagle Butte. Sam passed away in 2002 after 22 years of marriage. He was an independent family counselor who mainly worked with veterans who struggled with PTSD as well as drug and alcohol problems. The Powwow was already on BHSU campus when she started teaching, but it was like a traditional day Powwow. There was no contesting. There are Doctoral Programs in Arizona and Oklahoma, but few American Indian Studies Master Programs – one in Bozeman, Montana she said. “It will be an online program but I told them I would come back and help with that – the face-to-face in class,” said DeCory. She wants those taking the class, though they may all come from different places, to at least come for a time to experience the Black Hills. That’s what she is excited about – taking them to the sacred sites. DeCory also has plans to spend time with her maternal 100-year old auntie at Fort Yates on the Standing Rock. Her paternal grandfather is a Cuny from Pine Ridge, and her paternal grandmother is enrolled at Cheyenne River as a Fielder. Her mother is a Cadotte from Standing Rock, Wakpala. They are all descendants of Chief—Francis–Mad Bear. She will still do her beadwork, make baby moccasins—which she loves–and she start a book on Sam which she hopes to finish as well as her mother’s dissertation. “She died before she was able to publish her book –it’s on Mad Bear,” DeCory said, “So I want to do that for my mom. It’s still in rough draft form. I’ve got lots of stuff to do but I think the exciting part of this is I can say, ‘I’m sorry I can’t do that…’ I can pick and choose– my excuse before was I am sorry I can’t come I am teaching a class that day…but now I can say, ‘I’m doing something else,’” she said. DeCory knew Vine Deloria, Elizabeth Cook Lynn is “still here with us”. She said she learned not only from Deloria, but from her grandmother, her mom and others. This is why DeCory will not disparage other Lakota people.